This guest post from Christine Hughey is part of the “money stories” feature at Get Rich Slowly. Some stories contain general advice; others are examples of how a GRS reader achieved financial success — or failure. These stories feature folks from all stages of financial maturity. I met Christine in January when I attended Camp FI in Florida. Christine is starting a new Nashville food tour company, so when I spent a week there in April, naturally I let her show me around. It was awesome! In this article, she shares how small acts of kindness have proven to be worth more than she ever imagined. I'm about to share something that completely changed my life — yet it’s something that I didn’t know much about until a few years ago. It’s a concept called social capital, and I believe that it can change your life too (and make you wealthier in the process). Now, if you've been reading Get Rich Slowly for a long time, you might have seen J.D. write about social capital in the past. He too is a big believer in its power. But many of you have probably never heard of the idea. What is social capital? There's a lot of jargon in that definition, but what it really comes down to is this: Social capital is all about networking (in a non-slimy way) and about giving without the expectation of return. Although it's not tangible, social capital is very real and very powerful. It's also very valuable. That said, I don't see social capital discussed much on personal finance and financial independence blogs. I imagine that's because it’s hard to assign an actual dollar value to it. How do you assign a dollar value to helping somebody move? How do you quantify the savings when your neighbor mows your lawn for you all summer? What's the price tag on growing flower, fruits, or vegetables, then giving them to your friends and family? In the world of personal finance, we tend to look at numbers first. Social capital doesn’t work in that way. 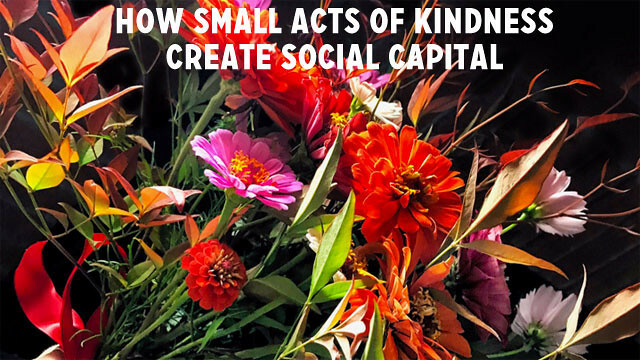 Social capital is about creating value and creating a positive impact among your social network, whether that value and network are small (like on a neighborhood level) or large (like volunteering time for a larger project). Social capital might make more sense (and seem less abstract) if we look at a real-life example. My husband was the one that really taught me about social capital. Jack and I came from drastically different backgrounds, and we did very different things for work. While I worked a full-time salary engineering job, he worked as a gig-style “man for hire” entrepreneur. When we first started dating, I noticed that he was often doing strange favors for people. He owned a truck so he would get calls to help everyone and their friends move. I’ll never forget the time that he got a call from his best friend Robert asking if he could help Robert’s co-worker move a washer and dryer. Sure enough, early on a Saturday morning Jack was off moving some woman's washer and dryer to a temporary home. A week later, he got another call to move the washer and dryer into the woman's new “permanent” home. I consider myself a very nice person, but I couldn’t believe how much time, effort, and gas Jack spent moving the same washer and dryer to multiple locations for someone he didn’t even know. But as a result, that “random” woman is now one of our very good friends, and Jack will be DJing her wedding this fall. Other great things have come from Jack's act of kindness. Robert hired Jack to manage the audio for some of the numerous music festivals that he puts on here in town. Amberly, (the random woman) helped support and promote a new DJ gig that Jack started in 2015. She's one of his biggest supporters to date.